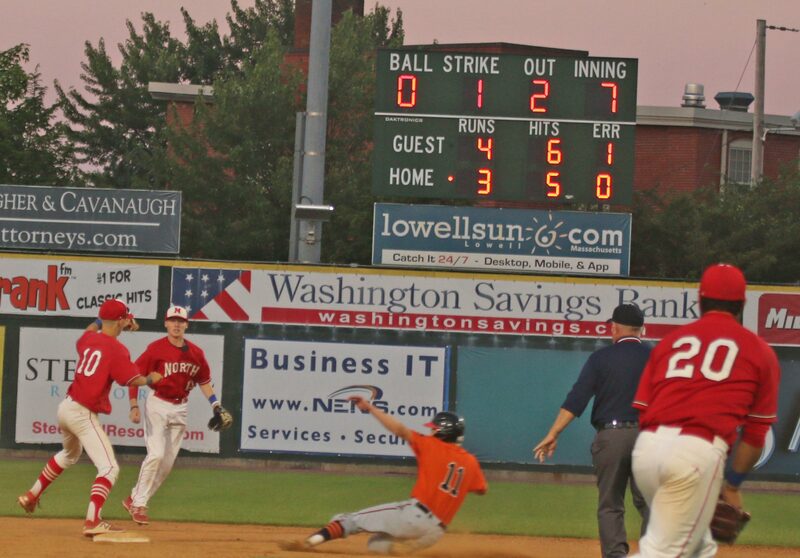 (Lowell MA) North Attleboro held off Beverly, 4-3, to win the Division Two state baseball title on Thursday night at LeLacheur Park in Lowell. 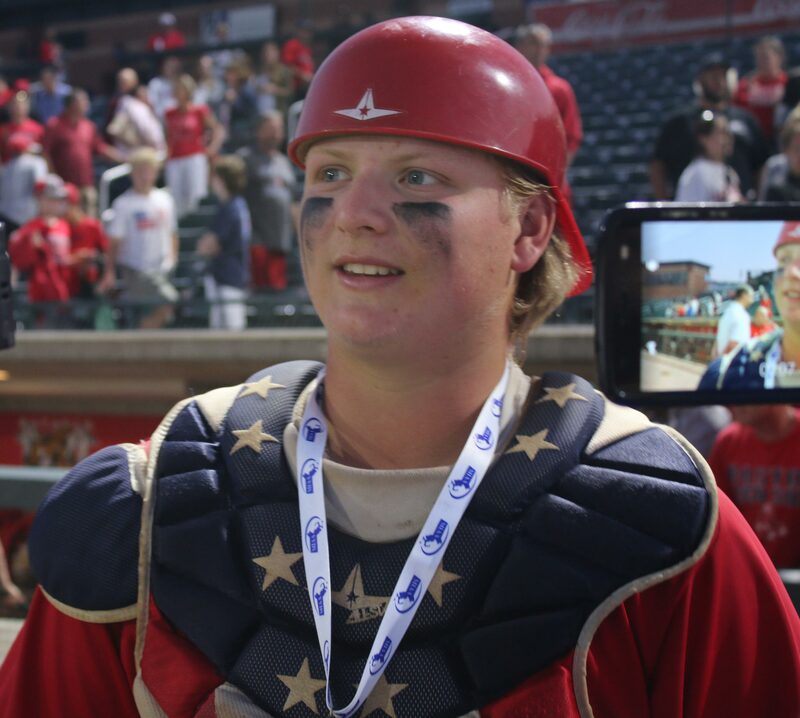 Zach was the hitting star for the Rockets (22-2) driving in all four runs with a single, double, and a sacrifice fly. 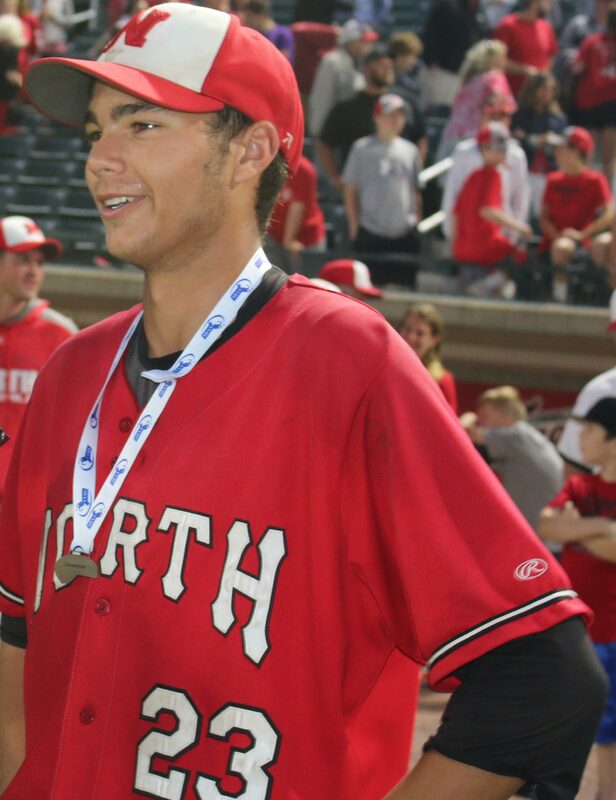 Zach’s sacrifice fly in the fifth inning gave NA a “comfortable” four-run lead, or so it seemed, with the way UMaine commit Nick Sinacola was pitching. But Beverly (20-5) had other ideas. In the bottom of the fifth the Panthers loaded the bases on a double (Ryan Munzing), single (Tim McCarthy), and a walk (Matt Collings). That brought Northeast Conference MVP Spencer Brown to the plate. 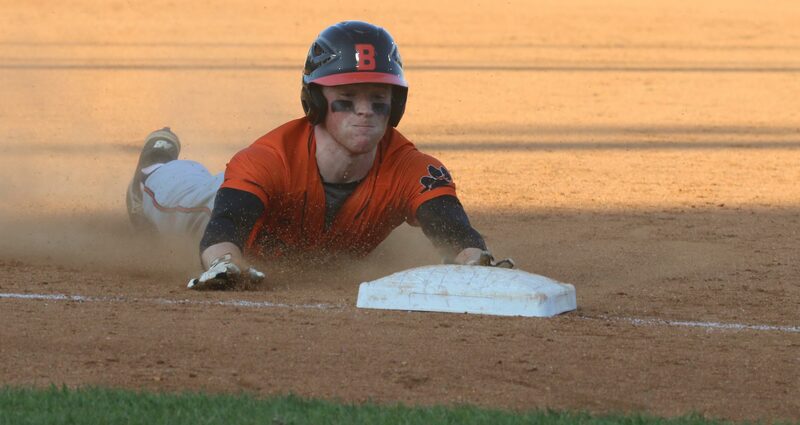 Spencer reached the left field fence, cleared the bases, and BHS was within a run. But it didn’t go out and that 4-3 held the rest of the way. 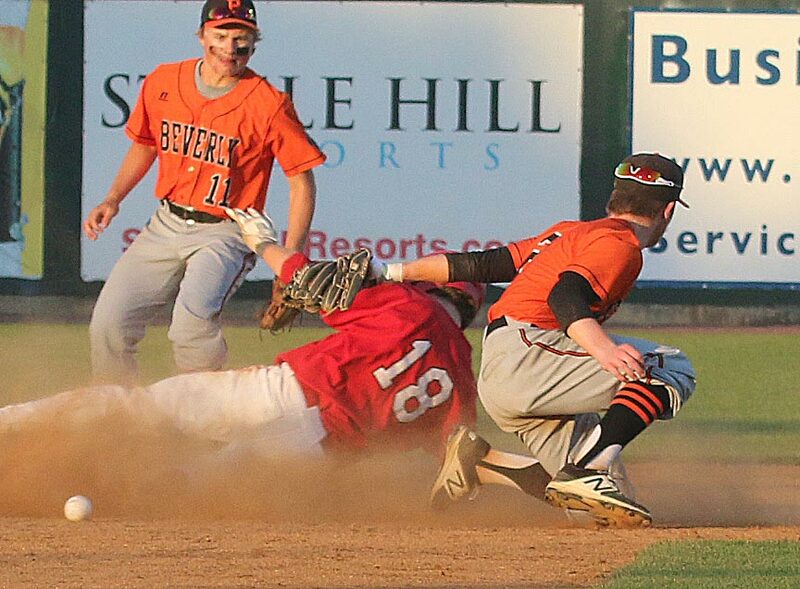 The Panthers stranded two in the first and twice ended innings with a runner on third base. There was little to choose between pitchers Spencer Brown and Nick Sinacola. Both allowed six hits and struck out nine. Spencer twice had a runner on third with no outs and escaped both times. 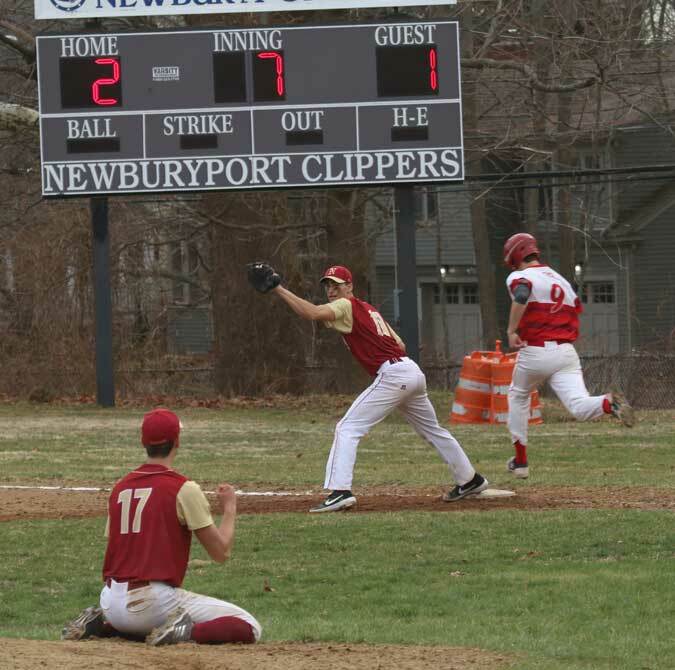 In the North Attleboro second, he struck out three straight, to end the threat. The Panthers were within a run with two innings left but costly baserunning hurt them in each of the last two innings. In the 6th, Matt Ploszay tried to stretch a single to right into a double. RF Jeff Gale threw a strike to nail him. In the 7th, Ryan Munzing walked leading off. 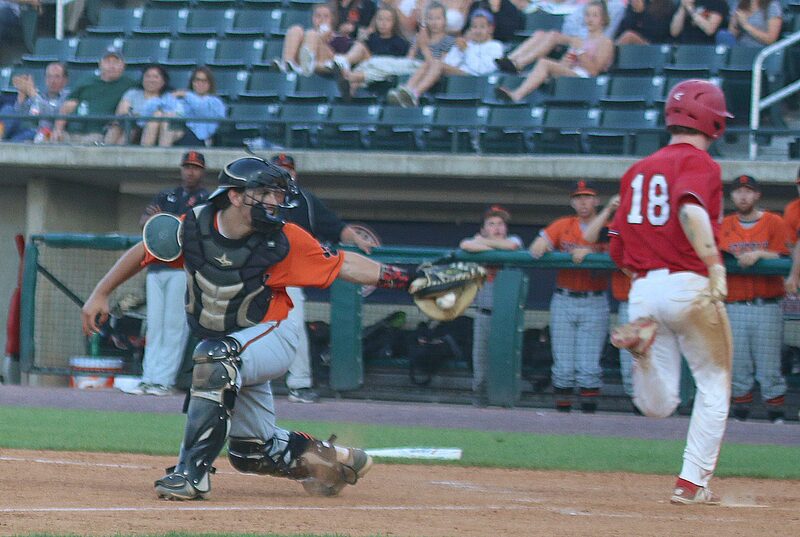 When next batter Connor Hanlon squared to bunt, the pitch got a short distance away from catcher Zach DeMattio. Ryan went well off the base and Zach alertly got him in a rundown. Nick Sinacola applied the tag although Ryan was already out for going wide to avoid the tag. 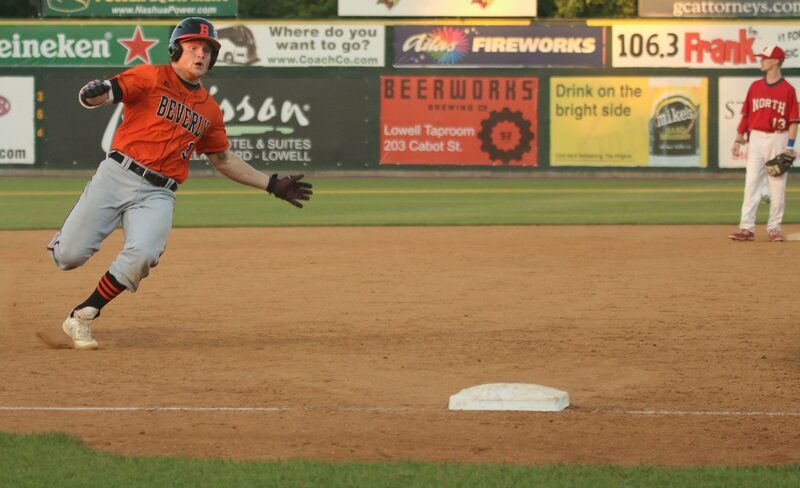 The Panthers had an infield single later in the 7th inning by Tim McCarthy but Matt Collins’ grounder to second turned into a game-ending forceout. 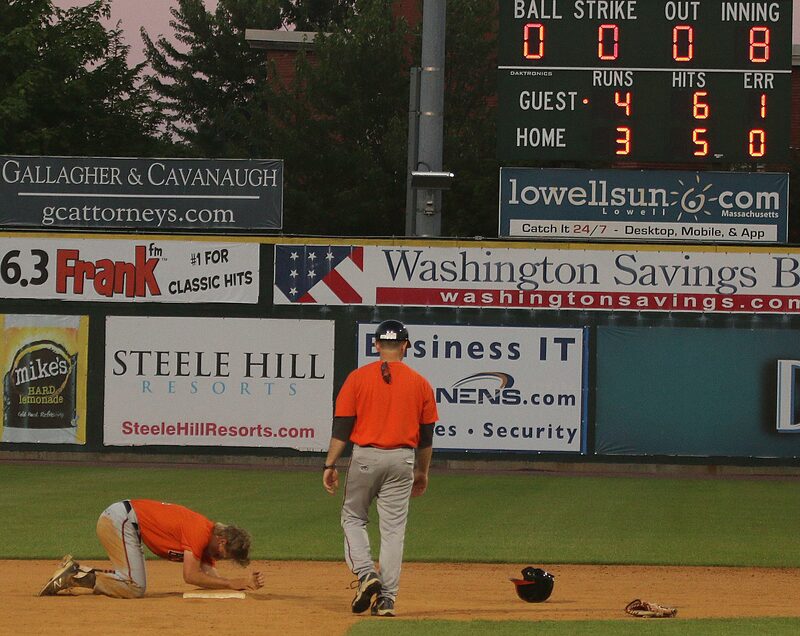 The costly rundown in the seventh kept Spencer Brown from getting another crack at Nick Sinacola. Looking for another reason why the Rockets won the game? Six stolen bases. NA was able to move into scoring position via the steal in the run-producing first (Nick Sinacola) and fifth (Brendan McHugh) innings. 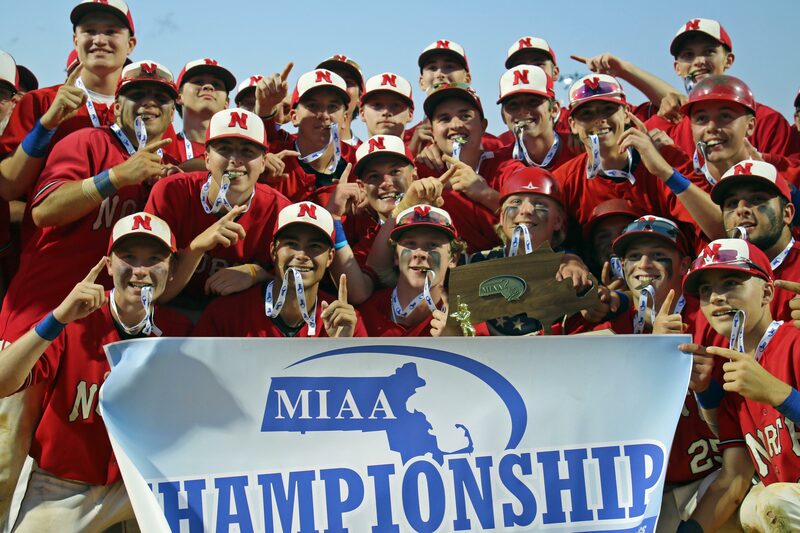 The title was the first one ever for North Attleboro. 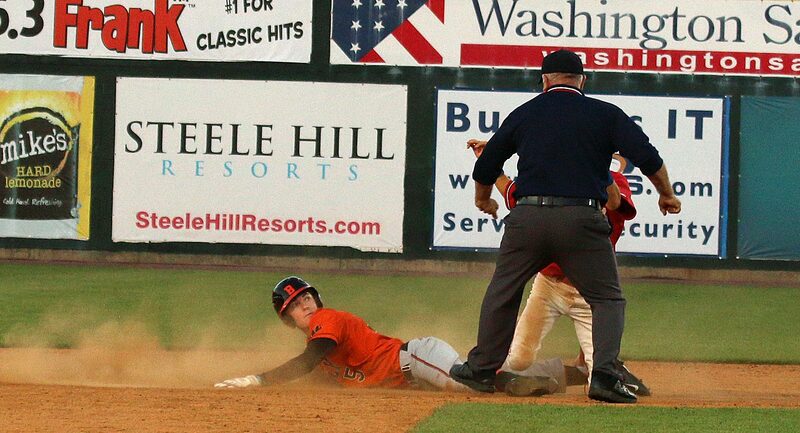 The Rockets (Hockomock League) only losses were to two Super Eight teams Mansfield and Franklin. NA blew through the D2 South outscoring three opponents 41-4. 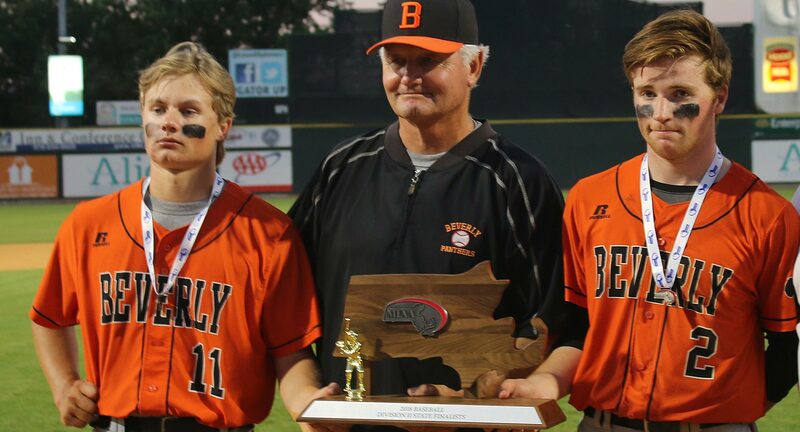 Beverly (Northeast Conference) upset #1 seed Masco to win the D2 North finals. 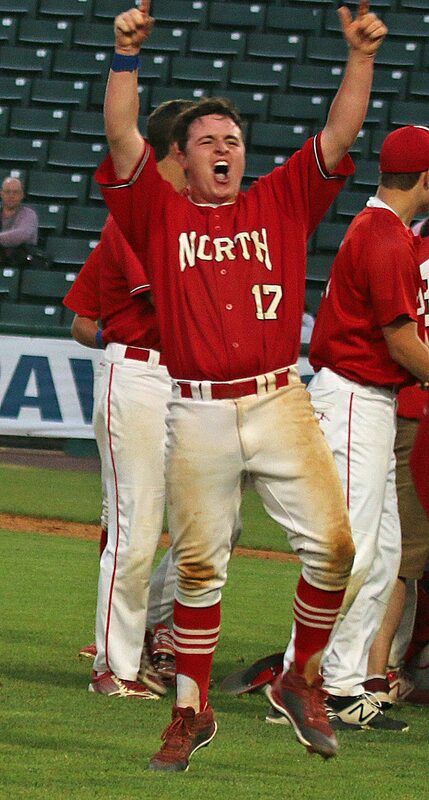 NA coach Mike Hart was notified after the game that he had been selected as Division 2 Coach-of-the-Year. The notifier was planning a photo-shoot in Braintree the next day. Mike sheepishly said that he wouldn’t be able to attend. Why? He was getting married on Saturday! 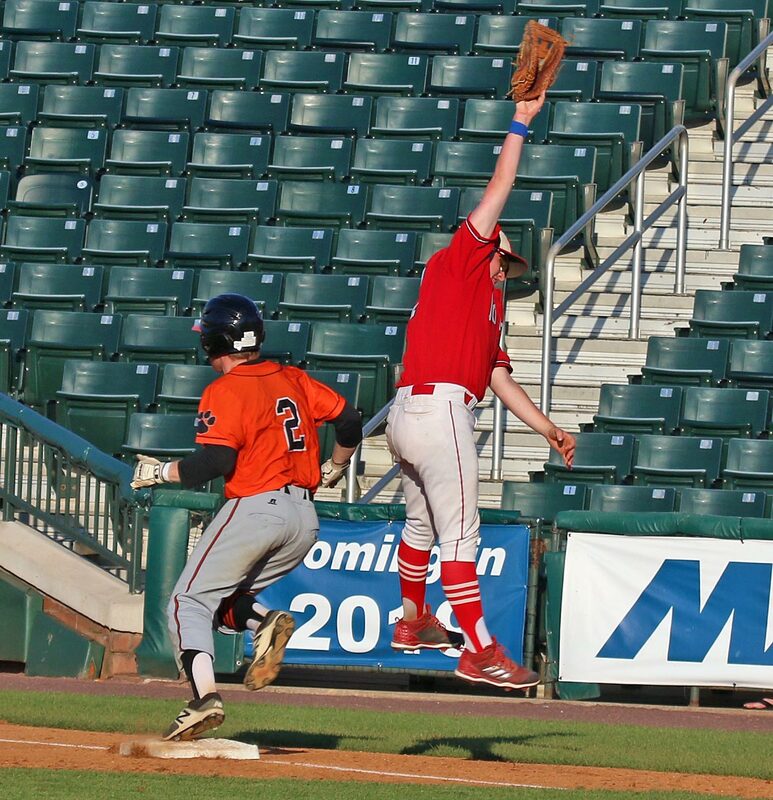 Brendan McHugh (18) and Nick Sinacola (23) scored on Zach DeMattio’s double in the second inning. I jokingly asked Mike what there was left for him to do! 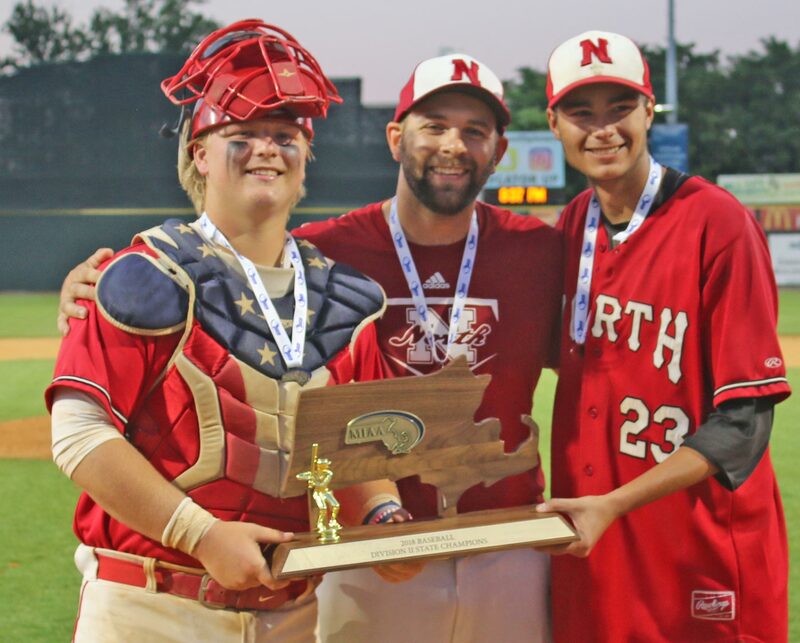 This is a first-year coach leading North Attleboro to their first-ever state baseball title. He answered by saying he wanted to develop baseball players and about his eight years with the program. However, I’m guessing that in a week or so when the reality of all that has happened, including the wedding, hits him he will realize what an amazing time this has been for him. The weather at LeLacheur was terrific. The internet? Not so good afterwards, hence the delayed posting of this story. Driving to Lowell during rush hour traffic is always a challenge when 495 is in the mix.